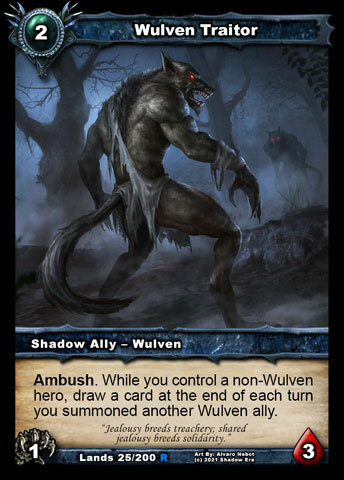 In this week's article, I'm going to depart from the usual format and dial things back to the birth of the game and then talk about the evolution of our card design process, arriving at three new spoilers from Lost Lands Part 1 that were created using our latest version of it. I'm really hoping you will read the whole thing, and find it illuminating or nostalgic or both, but I'll understand if you skip to the end to get to the spoilers. 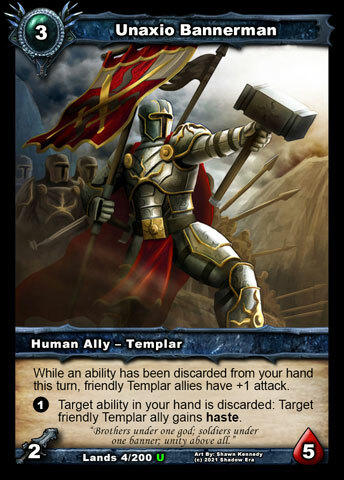 Right from its earliest debut in closed beta, community involvement has always been incredibly important to Shadow Era, both for improving the app and the card game simulated within. 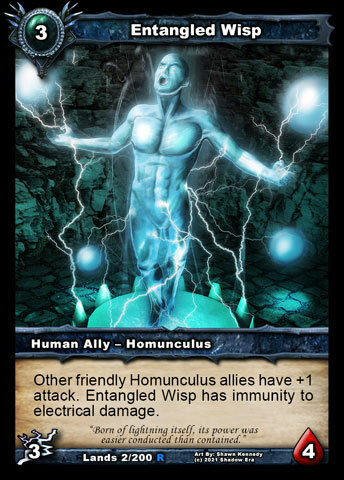 In terms of card design, this community involvement started out as posts on the official forum for each batch of 10 cards as they were revealed, followed by ongoing player input as each card was implemented and saw more action. Successive versions of the game incorporated this feedback to nerf and buff problem cards accordingly, as well as introducing more cards to fill out slots in the set. This worked really well for creating the pool of 120 cards that were included in the debut of the game on iOS. 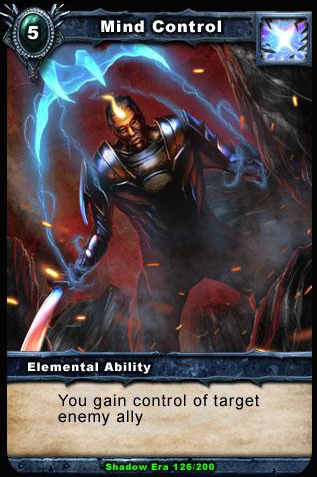 However, as more cards were added and as the player base continued to grow, the task of balancing the card pool as a whole became increasingly more difficult and more important. 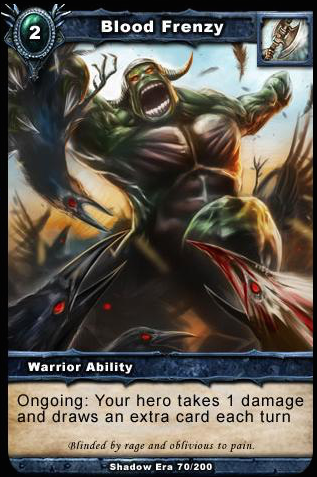 More cards meant more interactions and more cards to review; more players meant more opinions and more people to appease (or anger) with each change. The first major evolution of the design process was therefore a departure from seeking feedback from the entire community to help do the majority of rebalancing, opting instead to use the Players' Focus Group (PFG), which, as the name implies, is a focus group representing the players of the game as a whole. This allowed the fundamental idea of community involvement to be retained, but with two main advantages over the old approach: the smaller group of recruited volunteers offered much better opportunities for engagement and deeper dialogue between players and the Design Team; the amount of noise that could sometimes disrupt the balancing process was greatly reduced. 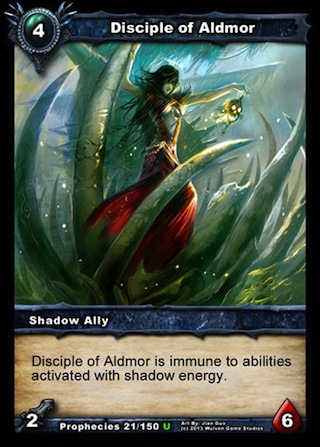 At its inception, the PFG consisted of about 30 players who were selected for their knowledge and experience of the game, and their first task was to help the newly formed Design Team rebalance the entire first set of Shadow Era, including approximately 27 cards that had not yet been released. The PFG operated as a combination of forum discussions and play-testing on a private server. Sure, there were the occasional heated arguments and controversies like you might see on the public forum from time to time, but the drama was manageable and it didn't take long to arrive at the first list of changes to be implemented and tested. From there, more changes were suggested and another iteration occurred. 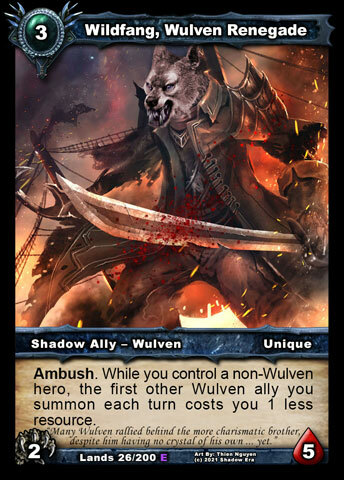 The next evolution of the card design process came when the Design Team were tasked with designing Shadow Era's first expansion, Dark Prophecies. Rather than let the set come together organically with community involvement throughout, like Call of the Crystals did, we planned out the whole thing from scratch as a cohesive whole. This allowed us to work around an overall theme for the set, both in terms of story and the new directions we wanted the gameplay to go. 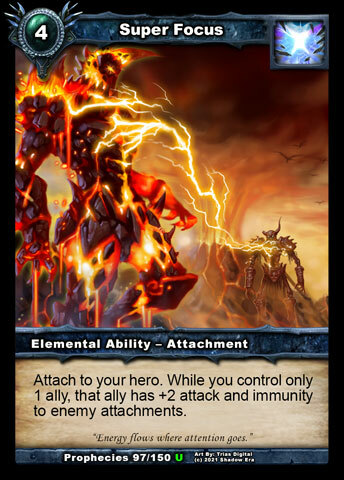 It also meant we could work towards balancing a final set of 350 cards instead of having to continuously achieve balance as individual batches were added. With regards the latter, we had also started to collect mountains of statistics from the live server to feed into our new designs to meet balance needs there. We could see which heroes really needed a boost and which cards needed some new synergies to make them as viable as we thought they could be. A lot of the planning and card discussions took place on our secret Design Team forum, while the individual cards were captured on a spreadsheet. Unfortunately, the separation of the two and the tendency for them to become out of sync, made it very hard to relate which discussions with which versions of which cards! To address this, another evolution happened: we adopted a fantastic web tool called Trello, which allows you to easily capture ideas about pretty much anything and then collaborate on those ideas, through comments, voting and progressive tweaking. Since we were spread around the world, meeting up at the same time was not usually possible to discuss things, so the asynchronous nature of it worked really well. Having said that, there were times we were all on the board together and we made some pretty rapid changes! We also used Trello to agree upon a style-of-play for each class, to help guide our designs in Dark Prophecies and beyond. This was based partly on the existing cards that we could no longer change in Call of the Crystals and partly on how we saw each class evolving. We debated whether we should release this information to the public, but we opted to instead let the cards speak for themselves as we added them, thus allowing the apparent style-of-play to emerge from how players used them. In terms of number of cards designed, we didn't go much beyond the size of the set. In fact, once we had all 150 slots filled, the card designs were transferred from Trello to a spreadsheet and sent off for implementation. In terms of timing, this happened quite close to when v1.503 came out, so there were few opportunities to take balance feedback from an established Call of the Crystals meta at that stage because there simply wasn't one. Another issue was that there were a decent number of cards we couldn't agree on as a team, in terms of suitability and balance, so we resolved that as best we could by deferring any changes until the PFG had seen them, letting their wider experience and knowledge help us decide what to do, since it had worked so well in PFG1. So the PFG was reformed (as PFG2) to give initial feedback on the set without playing with it, which led to some tweaks during the implementation. Once everything was ready to play with, PFG2 tested all 150 cards alongside the existing 200. As with Call of the Crystals, at the end of the PFG process, it went to test server and onto live server after that. By the time Dark Prophecies was locked down for printing, quite lot of cards had changed from those initially specified in the implementation spreadsheet. Most of the time, it was the ongoing play-testing that led to tweaks, but there were two other main reasons for changes: firstly, as the live server meta established itself in parallel to the PFG, the game stats we collected highlighted balance issues with classes or certain heroes that could potentially be solved with new cards, so we made room for as many problem-solver cards as we could; secondly, too many bad cards made it to implementation, which wasted everyone's time. Rather than design a whole set of 200 cards, we designed approximately 300 cards, and initially split those off into candidates for the set and those that still needed more work. 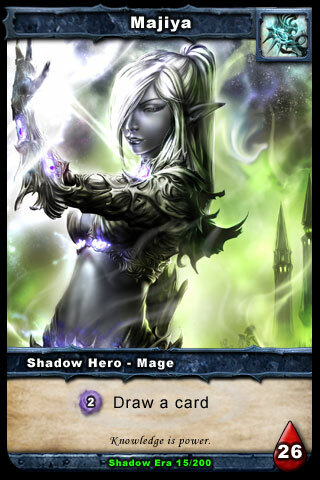 Some of the candidates included cards that didn't make it into Dark Prophecies for various reasons. Then, for each group of 10 slots for the set, we looked at all candidates for that group and chose 7 or 8 that appeared like they would work well together to go for implementation. 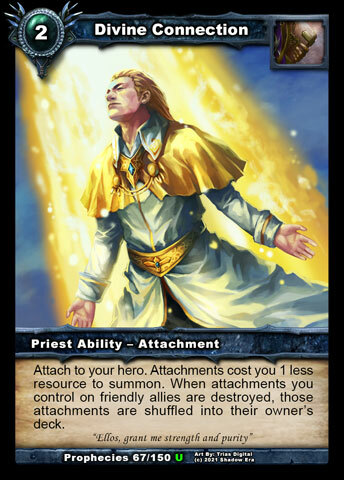 We deliberately left gaps knowing that we had spare candidates if necessary, but we figured we'd probably need them for cards designed to meet balance needs that would only become apparent later, from live server analysis closer to the Shattered Fates release. During this design process, we still had not yet locked down Dark Prophecies which allowed us to put in some changes that would fit better with what we knew was coming up in Shattered Fates. This overlapping approach to design was another important evolutionary step in the design process. 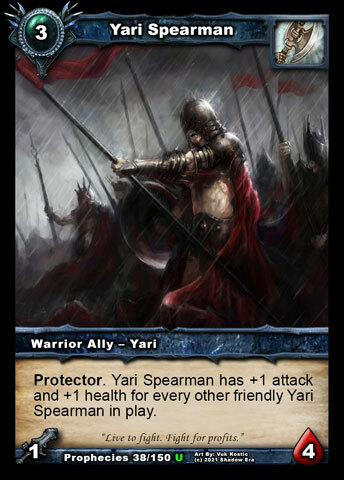 A good example of where this paid off was with a late nerf to Yari Spearman , who was now posing a significant limitation on what other great Yari cards we could make (see above). 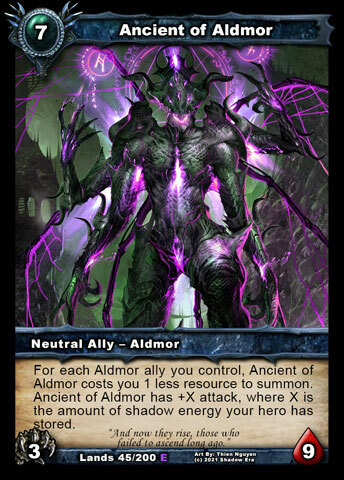 Similarly, our ahead-of-time planning of future sets meant a few cards like Disciple of Aldmor got a subtle update to foreshadow what might be coming later. The next evolution was the introduction of the Alpha Playtesting Group (APG). This was a subset of the previous PFG (PFG2) who would comment on and play-test an alpha version of the set (very early version) outside the game client with a generic card game simulator called Lackey. 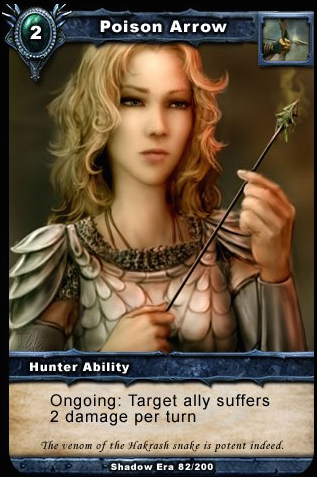 Since it was so quick to get the cards to them (we could generate placeholder images for the set in minutes), we decided we might as well fill all the empty slots from remaining candidates and use their feedback to help us cut each group back down to 8. After the APG, we started up the PFG again (as PFG3) and followed a similar process to PFG2. The main difference was that the entire card list was not revealed at first and cards were added to the private server in batches, to ensure better test coverage and awareness of each new card. Although there would have been benefits to having them see all 200 cards in one go, we thought that giving the full list would be overwhelming and also lead to a heavy skew towards the seemingly exciting cards and neglect of others. The similarities to how the first set was released to the public were not coincidental, but actually a deliberate departure from how we approached things in Dark Prophecies, where interest and activity tailed off after we'd revealed everything from the outset. That's not meant to be a criticism of those involved in PFG2 - it's just a comment on human nature. A steady flow of new cards would have better kept interest and activity in the PFG at required levels, and it would help each card get more attention than it might have had otherwise. 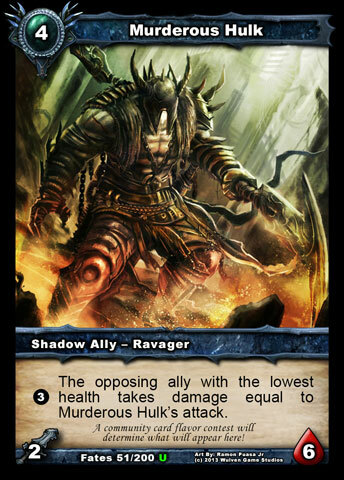 In terms of the batches, we started out with the faction allies because they are usable across more decks. We later added the class-specific cards that we hoped would deliver a stronger alignment between each class and its intended style of play, as well as giving overall balance between classes. Occasionally a strong faction card was moved into the appropriate class for its strength. Still with me or did you just hop straight here? Either way, it's almost time to unveil three new spoilers that tie all the evolutionary steps of the design process together. 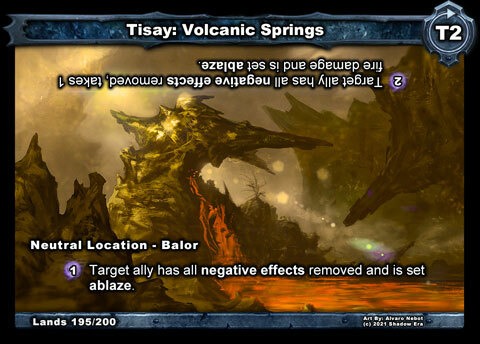 But, before that, I want to highlight a couple more innovations we introduced in Lost Lands. Firstly, we now have a very streamlined development process that can take an idea from brain to Trello board to implementation and testing all within the same day! Whilst the majority of the set is not expected to be filled this way, the possibility to do this means that significant theory-crafting before testing of any card idea (new or old) is simply not required. Nor do we need to employ third-party tools like Lackey for APG testing. 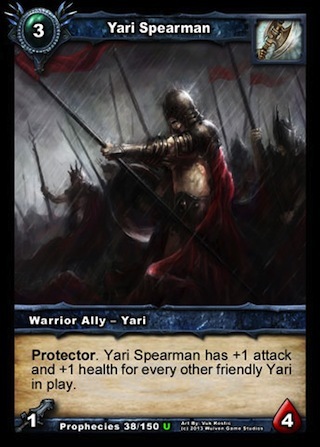 The streamlined process also allows cards to go through iterations of testing and tweaking much faster than before. Secondly, we've decided to design and release the cards in the set in parts, with each part effectively acting like its own mini-expansion, but ultimately forming one entire cohesive set. 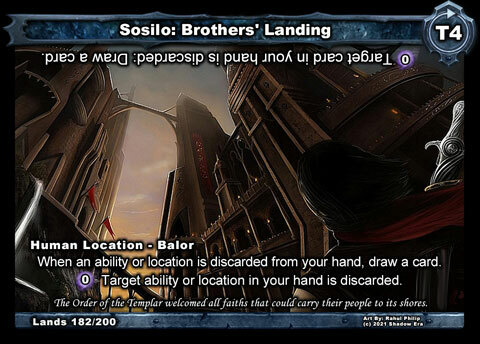 As with Shattered Fates, there are a huge number of candidate cards designed and a plan in place, but many cards are being held back because they are not intended for Part 1, which is focused on faction allies and neutral allies and locations, our brand new card type. 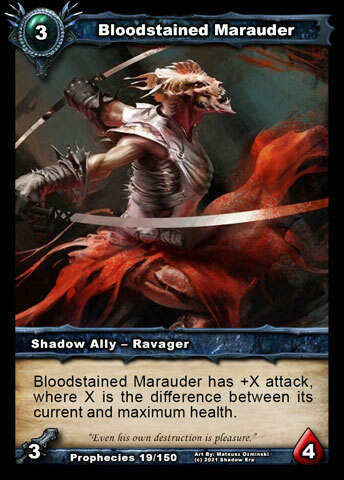 This is in part due to our design goal of boosting tribal decks, but also because of what we learned in the Shattered Fates testing: starting out with cards that can be used across more decks allows us to get more test coverage sooner and a better understanding of their balance. This foundation for the rest of the cards in future parts also acts as a literal level playing field for all the class-specific cards from previous sets. Accordingly, we have high hopes that our current three sets combined with Lost Lands Part 1 will offer the greatest balance and variety in the history of the game! 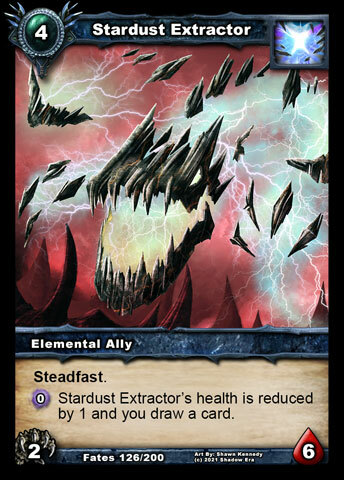 This design and release in parts also allows us to take the overlapping design approach to the maximum, which you've probably noticed by some changes to Shattered Fates that appear to be largely pointless, such as changing the activation cost on Stardust Extractor from 0cc to 0SE. (Hopefully, it will make sense at some point in the future.) 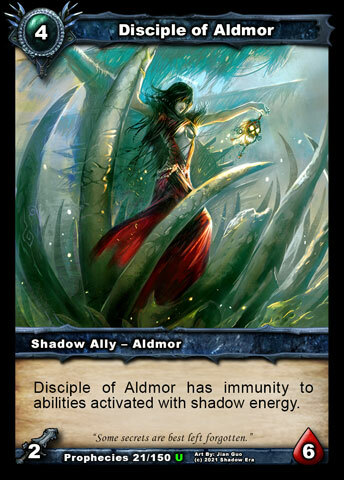 The reverse is also true where our knowledge of Shattered Fates balance is feeding into cards in Lost Lands. 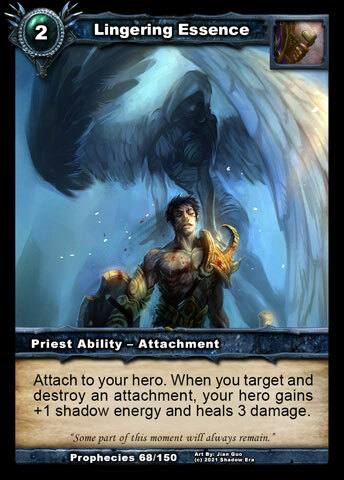 At the time of writing, the PFG have done an outstanding job of getting Part 1 to a state where we believe many cards are now ready for public spoilers (hence these articles) and almost of all Part 1 is ready for the test server. Once it's there, we will continue to balance it, whilst simultaneously working on Part 2 with the PFG again. Then, after Part 1 has gone live and Part 2 has hit the test server, there's a very good chance that Part 1, Part 2 and Part 3 will all be evolving at the same time, involving various different subsets of the player-base. Finally, the journey will end and all three parts will meet up on the live server, where we will do our final balance tweaks driven by the collective thoughts and activity of the entire player-base, which has served us so well to this point. Speaking of a long journey, with three things meeting at the end, our trip through the evolution of our design process is now complete, and I'm simultaneously pleased and scared to introduce three new "fatties" that are from Part 1 of Lost Lands! First up, we have a character who really lives up to his name, from his appearance to his effects, and even his design history. Yes, the original idea dates back to the tail end of Dark Prophecies when we had already filled up all the slots and he instead became imprisoned on a spare Trello board for unused card ideas. For most of the time since then, he has been forgotten by all but its creator, only to be rediscovered when we were re-reading some of our old boards to see if any ideas there were more suitable now than previously. 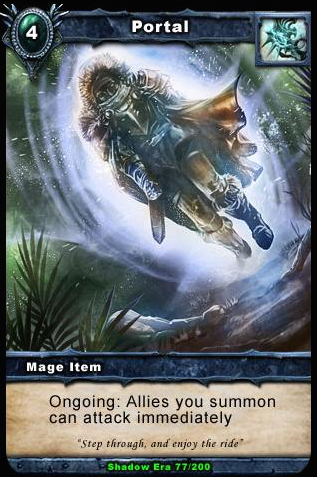 He was unleashed on the Lost Lands APG team in pretty much the state he was left in, but then he was updated to include some more tribal-centric features and synergy with the freeze theme, which will be built on by other cards (not yet revealed). 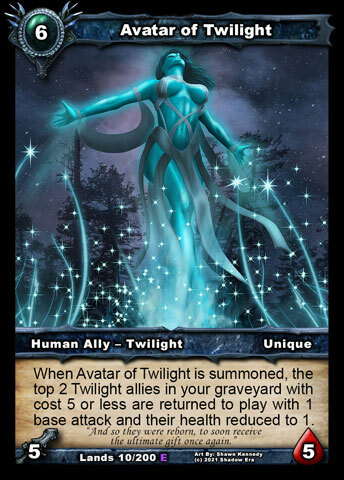 Next up, we have Avatar of Twilight , which actually debuted in the Shattered Fates set but was removed at the PFG phase due to being potentially broken. 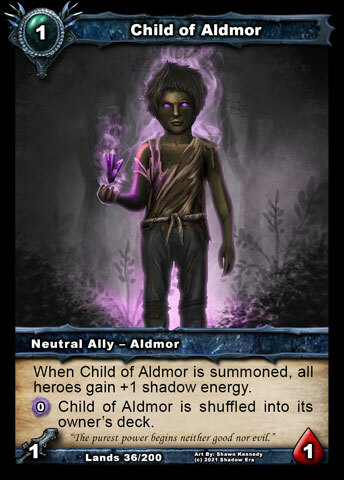 Its new form is a little different to the original but it follows the same idea of bringing back some of your Twilight allies so they can be reused for more value. 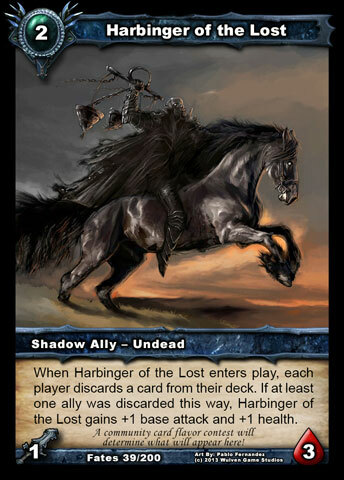 As with Forgotten Horror, play-testing led to some tweaks, including have it exile itself when killed so that other copies of Avatar of Twilight in your grave would not limit how many allies would actually be returned (the uniqueness rule would prevent a second copy being on the board). 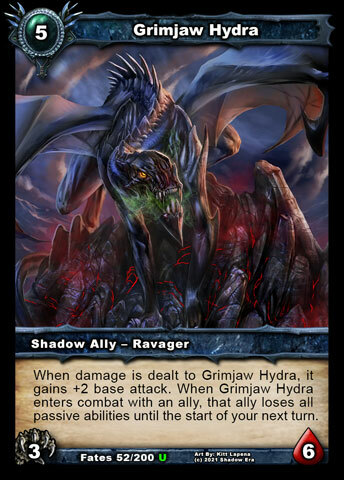 Finally, we have a card that originally came into being as two separate cards that were designed specifically for Lost Lands to address two different goals: 1) building on the attack-increase-on-damage sub-theme of Ravagers that appeared in the very first Ravager, Bloodstained Marauder , and was then extended with Grimjaw Hydra ; 2) allowing a player to exploit their use of items and abilities without necessarily blowing them up (yet!). 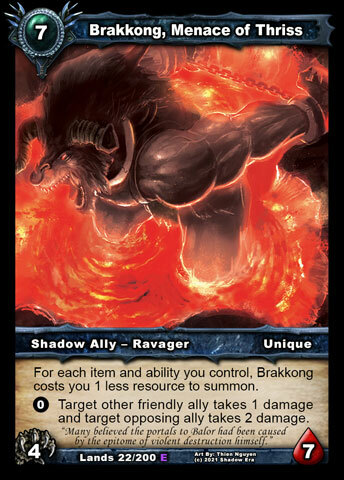 The latter card was already a big heavy ally that got conditionally cheaper to summon, but we moved the other effect from a smaller ally onto him, to give a greater chance that the ally would survive long enough to active its ability. And, I'm really pleased to say, that's it for this week. This has ended up much longer than I thought it would be! I will endeavour to do more research in advance next time, so that my article does not become such a tome of knowledge. That art is amazing. Avatar is incredible! Really nice, I like how the set is being released in phases as it allows us to get our hands on with the cards earlier and also have an evolving meta which will keep my interest. Really looking forward to when the first set of cards hits the test server. Some very cool insights into the whole process and how the process evolved for the DT from set to set. Sounds like each time they developing the process to make everything more streamlined and quicker. 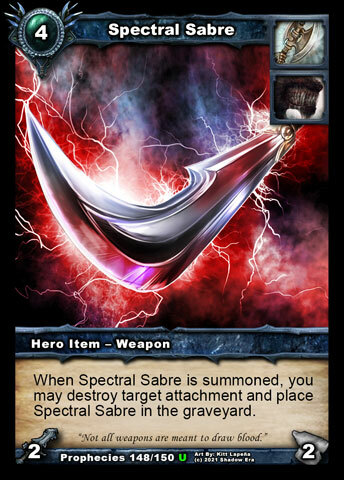 Cool spoilers as well. The artwork for Avatar is especially nice. 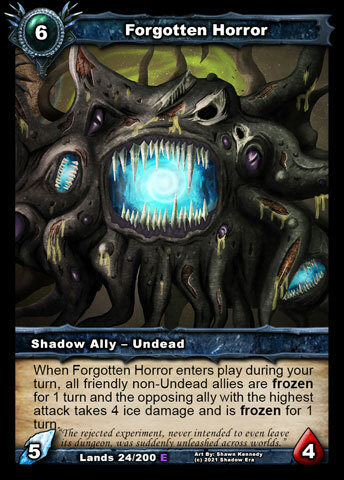 The art for Forgotten Horror looks a bit more Homunculus than Undead IMO, but I do like the backstory on his name of being an old forgotten idea, and now he is the "Forgotten" Horror, lol. Menace of Thriss, is crazy powerful. Great to see some friends for hydra and blood stained maurader. Gondorian - loving the teasers. Is there an expected delivery date (at a month level) for the release of Part 1 into LIVE? Hiya. If you take the rate the cards are being spoiled (3 per week) and extrapolate from there, I think you will arrive at a reasonable ballpark estimate. Then, if the rate drops or increases, you can rework that estimate. That's the best indication I can give. These are exciting to read! 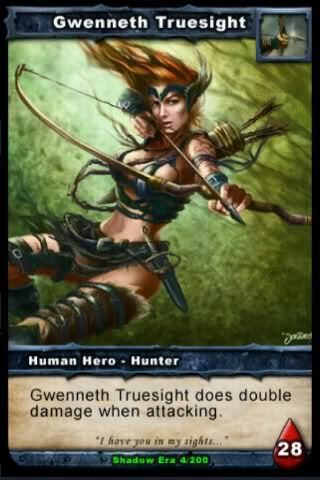 Wonderful art for Avatar of Twilight .